When Bobcat walks through winter, she hides her secrets among the trees of the frozen forest. 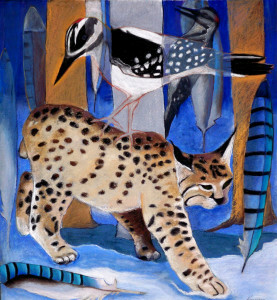 Woodpecker drums notice of Bobcat’s coming, while Blue Jay flies above her, sacrificing feathers to mark what is hidden, thus revealing Bobcat’s secrets for those who can hear and see. This painting is an expression of my shamanic memory of this unusual event. The original and prints are available through the art gallery at The Standing Bear Center for Shamanic Studies. You can also contact me directly online or by calling me: 207.664-0752.